The conference took place Oct. 3-4 at the Crowne Plaza Hotel. Several hundred safety professionals were in attendance and over 50 exhibitors showcased their products and services. 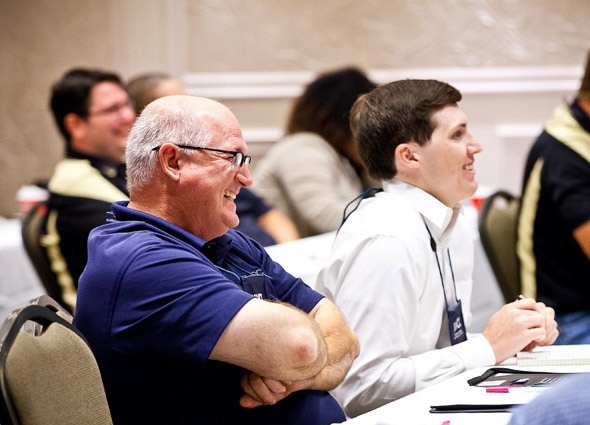 With over 25 sessions to choose from, conference attendees had an opportunity to explore topics that are crucial to assuring a safe workplace while satisfying some of their continuing education requirements and earning continuing education units (CEUs). Topics included complacency, hazard management and recognition, job safety analyses, basic ergonomic principles, wellness, communication strategies, recordkeeping, leadership and drugs in the workplace. The annual event attracted professionals from a variety of industry sectors: chemical, construction, emergency and environmental management, fire, health care, industrial hygiene, security, utilities, and municipalities and public employers. Sessions were geared toward those who have been in the health and safety field for years, as well as those who are just beginning their careers. Regardless of experience levels, attendees left each session with a sample plan or specific knowledge that could be applied directly to their jobs. The conference kicked off on Monday with an OSHA update from Dorinda Folse, OSHA area director for Baton Rouge. The presentation offered applicable information to help organizations avoid costly citations and incidents that take an even more costly human toll. Folse also provided the top 10 most cited standards for fiscal year 2015. Nationally, falls topped the list. However, citations involving aerial lifts topped the Top 10 list for Louisiana. This year’s keynote speaker was Bob Anderson of Leading Challenges. He focused on emotional intelligence, which involves the ability to recognize and understand your own emotions and the emotions of others. Anderson also discussed the importance of the six universal emotions: happiness, sadness, surprise, anger, fear and disgust. Anderson said he believes that by developing emotional intelligence leaders and employees can greatly increase their professional performance and enhance their personal lives. Tuesday’s “I’ve Seen Fire & I’ve Seen Rain” panel discussion featured business owners and managers who spoke about real disasters that have impacted their businesses and tested their business continuity plans. Panelists included Scott Barringer, president/CEO of PALA-Interstate LLC; Keith Sliman, safety security manager of Ford, Bacon & Davis LLC; Trey Crawford, vice president of Grady Crawford Construction Co.; and Norman Morris, CEO of Louisiana Realtors Association. The panel was moderated by William “Bill” Dufrene, senior vice president of operations at Alliance Safety Council. These business owners agreed that acting quickly when facing a disaster is critical. You must empower employees to make tough decisions during a crisis. A recap video with highlights from the conference can be viewed at www.youtube.com/TheSafetyTube.